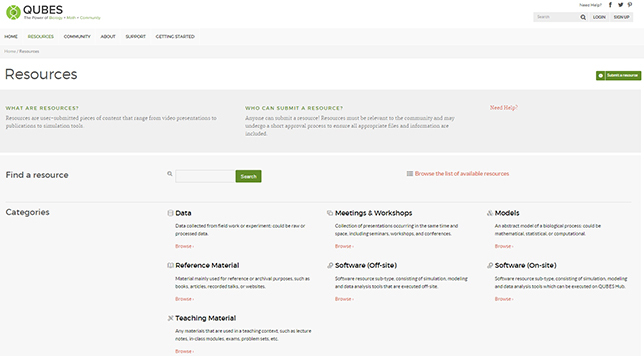 The QUBES resource library features a range of teaching materials, from video presentations to publications to simulation tools. A big phase is done in a cross-institutional project to bring math and biology experts together for interdisciplinary teaching. The goal is to help undergraduate students understand the quantitative reasoning and computational skills they need for their biology courses. Quantitative Undergraduate Biology Education and Synthesis (QUBES) is an educational repository with a Facebook-like interface that brings biologists and mathematicians together in order to discuss teaching submissions, pedagogies and instructional approaches "in an efficient manner," according to the award proposal submitted to the National Science Foundation, which is funding the work. The research brings together numerous institutions as well as professional societies. Among the participants are Maine's Unity College, the University of Pittsburgh and four other schools, along with the Society for Mathematical Biology, the American Mathematical Society and the National Institute for Mathematical Biology and Synthesis. QUBES, which has been built with open source components, currently includes 99 teaching resources, such as modules on global temperature change in the 21st century, the molecular evolution of DNA sequences and the "friendship paradox" and how it affects disease transmission. Members of the user community may provide comments and ratings on the resources, and the portal is intended to bring educators together to collaborate across disciplines in additional curriculum development. Unity associate professor Carrie Diaz Eaton said in a prepared statement that she hopes the availability of the materials will encourage faculty to reform their courses and integrate quantitative skills into biological science programs. "We are pleased that Unity College has the opportunity to take a leadership role on such an important issue facing not only biology education, but sustainability science education," said Diaz Eaton. "To keep up with advances in science in the 21st century, we need educators to have access to the right tools, and the support to teach with them." The project, whose major grants go through August 2019, is funded jointly by NSF's Directorate for Biological Sciences and the Directorate of Education & Human Resources, Division of Undergraduate Education.